I’ve written here before about my youngest son’s undying love for the almighty Snickerdoodle. While he loved the Snickerdoodle Muffins I made him, they did not stand a chance against this Snickerdoodle Ice Cream. Honestly, I think this is the best ice cream I have ever made. The most amazing part; it tastes exactly like a Snickerdoodle. Exactly. When my picky eater tasted this, his eyes lit up in amazement. “Mom, how did you do this?” Music to my ears. I got him. Not only is this delicious, it happens to be about one of the easiest recipes to throw together. There is no custard to make. No cooling off period in the fridge and it sets up nice in the freezer. Photographing ice cream is always a challenge. I always freeze the dishes to keep the ice cream cold, freeze the ice cream scoop and work quickly, otherwise…it just melts. No real surprises. As I was dishing this ice cream out for its little paparazzi shoot, I left the scoop in the container and placed it back in the freezer (just in case I needed to scoop more later). After I was done taking pictures I put everything away and retrieved the scoop from inside the ice cream box. The scoop had lots of ice cream debris remaining on it and without thinking, I licked the scoop. All I can say is, I won’t be doing that again anytime soon. Ugh. Enjoy this ice cream, I highly recommend it. In a large bowl combine 1/2 cup granulated sugar, 1/2 cup packed light brown sugar, 1/2 teaspoon cinnamon and 1/8 teaspoon nutmeg. 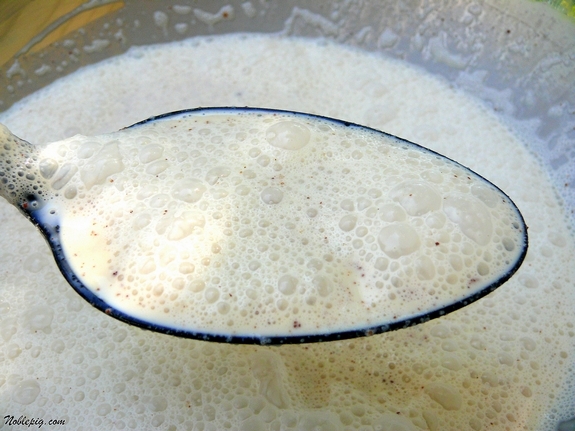 Add 2 cups heavy whipping cream, 1-1/2 cups half and half and 1-1/2 teaspoons vanilla extract and mix until smooth; I used my hand-mixer. Pour the cold mixture immediately into ice cream maker and freeze according to the manufacturer’s instructions. Mine took about 20 minutes. Scoop ice cream into a freezer safe-container. Freeze. Garnish with a Snickerdoodle cookie if you have some. We always do. This just might be the perfect recipe to have my granddaughters help me make. 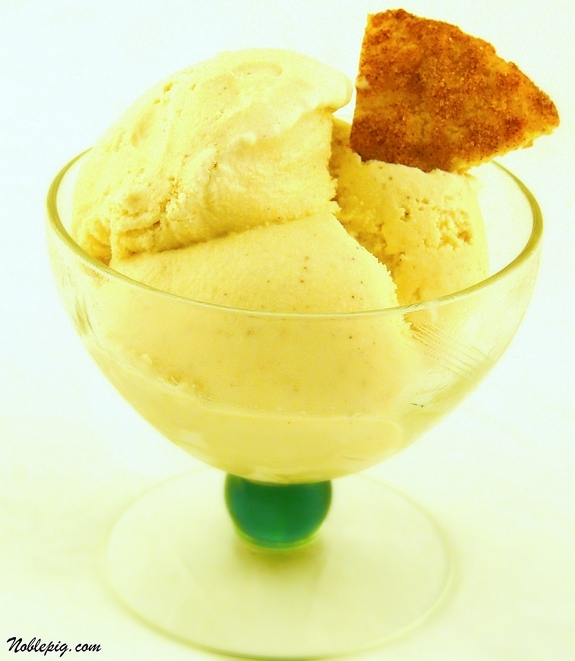 Hot weather and ice cream, snickerdoodle ice cream at that! I’ve read & re read this a number of times. U serious? No EGGS? I love it Cathy! Your son has good taste, & his mother is fab! This is a great great recipe. Oh, and BTW, really sorry about your tongue…OUCH!! Wow, you’ve got me, too! The only thing better than snickerdoodles themselves would be snickerdoodle ice cream. If they sold that in shops, that would be the #1 flavor (well, if it were as good as yours anyway). I only have an old-fashioned (think labor intensive) ice cream maker, but this is a reason to run right out and get one. A late BD present to myself perhaps … sounds good to me! 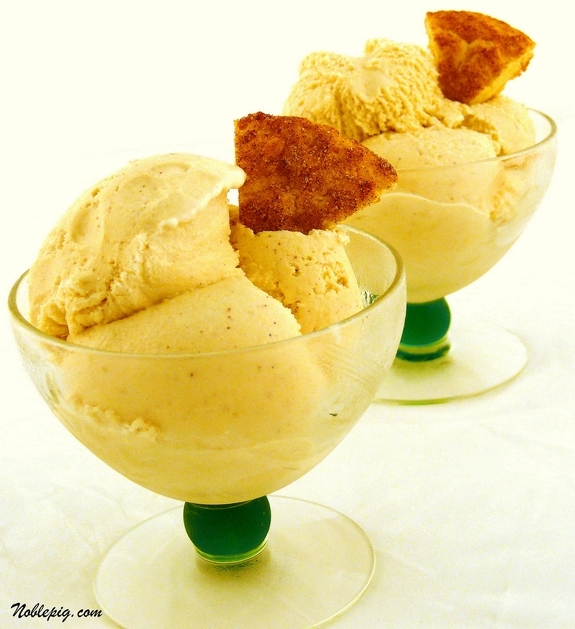 Wow, snickerdoodle ice cream sounds very neat and so good! I love this recipe! I made Snickerdoodle ice cream over the 4th and loved it. Wasn’t this no custard recipe however. I’ll have to try this one next. Can’t remember if I told you that I made the blueberry ice cream this weekend. WONDERFU, and I even messed up and used the wrong carton, milk instead of cream. Darnit. It’s still very good. That looks unbelievably delicious. I adore snickerdoodles. Yum! Again I cannot wait. thanks. Yup! You got him with that one! And I’m going to remember the frozen scoop wisdom as well! just imagining this sandwiched between snickerdoodle cookies! I was flipping through Martha Stewart’s new cupcakes cookbook and saw a recipe for Snickerdoodle Cupcakes. I didn’t buy the cookbook, but I think I might go on Amazon and get it just so I can make that recipe. I going to desperately try and remember to pick up the ingredients tonight. My brother is going off shore for a month this weekend and I want to cook him a good meal. I think he would love this ice cream to top it off. Oh my Lord I just died and went to ice cream heaven! And drat! We have all these blueberries and raspberries I have to use first before I can dig into this recipe. I don’t know if I can wait. 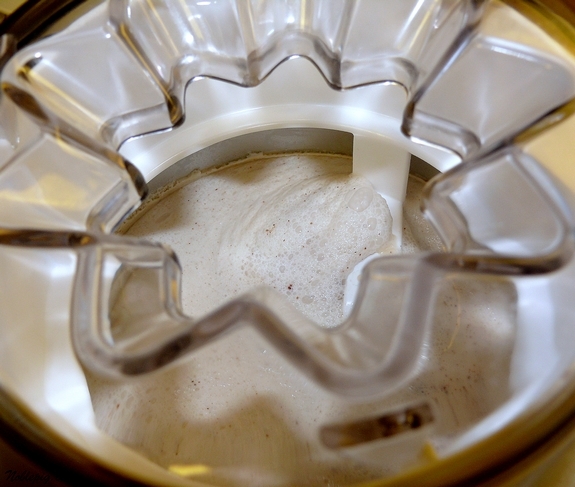 My kids LOVE snickerdoodles – I have never been closer to buying an ice cream maker then right now!!! Our oldest grandson LOVES snickerdoodles and I love making them for him. I’m going to have to surprise him with this ice cream. Just a tiny FYI – there’s a typo in your recipe. It currently says 1/8 tsp cinnamon instead of nutmeg. Thanks for a great recipe! this is simply unfair. actually, it’s probably best that this isn’t within arm’s reach because i would get FAT. ridiculously, irreconcilably fat. I’ve made the mistake of licking the frozen scoop before, and it is NOT fun. However, I love ice cream so much, I think I lose my mind for a second every time and just keep doing it! Oh yum! Now if only I had an ice cream maker!! i hate photographing ice cream too. but this one is now on my must make list because i love snickerdoodles. I have no idea what a snickerdoodle tastes like, but this looks GOOD. Oh man, I’m going to put on so much weight. Rockin ice cream! No one’s ever made that one for us before, and it’s a nice way to start today. This is a diet killer of a recipe. It looks incredibly good. Now, to test my will power. I can see that entering my freezer. Maybe today. The snickerdoodle fans at my house would love this ice cream! It sounds so easy to make too. Wow! This is similar to my go to ice cream recipe so I know it must be good. and the spoon…made me think of the little boy in The Christmas Story…and the pole. Wow, all the goodies is in this ice cream. Yum! Seriously…I’m pretty sure I love you. If that makes me odd, I don’t want to be even. Ooh I must try this one out, sounds so easy! What a great flavor! Your recipe does look easier. I’ll have to try it! Thanks for trying this out… I’m a Snickerdoodle FANATIC, and I’m glad you liked it too!! I have this in the ice cream freezer now! My kids are going to love you. BWAHAHA sorry couldn’t help it, I laughed out loud with the vision of your tongue stuck to that scoop. Hee hee… chuckle giggle snort. The icecream looks delicious! At times like these, I wish I had an icecream maker. absolute yum.. perfect day here to indulge! Ice cream, easy, snickerdoodle. What else is there to say! Wowowow I love your pics and this ice cream looks amazing! Oh, gosh. What could be better than frozen snickerdoodle?? As soon as I’m done working my way through Lebovitz, this is going on my list of things to make!! 🙂 Heaven. That looks delicious. And you have more energy that 14,000 energizer bunnies! Don’t know how you do all you do, but glad you do and that you share it with all us not so energizered folks. A boy after my own heart. Snickerdoodles are the best…I take that back. Snickerdoodle ice cream is the best! Can’t wait to make this one. Hi Cathy .. glad he can eat .. and I hope he enjoys himself .. and leaves some for the rest of the family. I grew up eating snickerdoodles and adore them. They happen to be the state cookie of Connecticut. Somehow I missed your snickerdoodle muffins? Will give those a try and this yummy looking icecream. Thanks for the tongue warning, as that is something I would do. Oh, my! My guy loves my snickerdoodles. Loves ’em. And he loves my homemade ice cream. I think you’ve given me the tools to totally bushwhack him. He doesn’t stand a chance! Holy cow – that looks amazing!! I need an icecream maker now! You’ve just brought back a terrible memory. I got my tongue stuck to a creamsicle when I was a child. Oh,,the pain. This ice cream looks heavenly. Love the flavors. This sounds so good! Cinnamon in ice cream always reminds me of Mexican fried ice cream. Which I love! What a great creation – I love the cookies so I am sure the ice cream will put me over the top!! Excited to try this one! I hope your tongue has survived the slaughter! This ice cream would be WONDERFUL with apple pie. I am soooo in a Snickerdoodle mood and bummed that I don’t have an ice cream freezer. Your pictures are quite tempting! You might be having me make ice cream yet! This looks amazing! I’ve never actually had a snickerdoodle but this sounds amazing with cinnamon and nutmeg! Wonderful Cathy…I have been wanting something simple & this looks easy & YUMMY! Thanks! oh dear, this and some chunks of snickerdoodle muffins or cookies are a match made in heaven–seriously. This is the reason I am on the hunt for an ice cream maker.. tomorrow, screw my houseguests, they can do without me for a while. I want one so I can make this! I actually had one that I got for my wedding 14 years ago, and after moving it several times without ever opening it, I sold it at a yard sale…now I want it back! We make homemade ice cream quite often…so we will try this…it looks de-lish!!! LOVE SNICKERDOODLES!!!!!! Well I do love all things Snickerdoodle. This ice cream sounds wonderful! We haven’t even tasted this incredible-looking concoction, but we’re pretty sure you’ve got us too! Honestly, who wouldn’t love Snickerdoodle Ice Cream? I think that would make a great milkshake, too. thanks for posting this! i just made it (one of the easiest ice cream recipes ever) and it tastes amazing. i can’t wait for it to cure in the freezer so i can dig in! Just had to report back that I made this recipe last night using coconut milk instead of dairy for our support group (we have a lot of dairy free folks) and everyone agreed it was heavenly. What a wonderful way to break in my new ice cream maker! Thanks, Cathy! Just made this with a few minor changes (a bit less sugar and a bit more vanilla) and it is great! Bringing it to an autumn pot luck tonight, to be served in baked apple “bowls.” Thanks! OMG! My Hubby loves anything snickerdoodle! He will flip over these 🙂 Yay! Thanks, Cathy!